The Alila hotel group’s latest opening in Solo offers an absorbing mix of modern architecture, history, dramatic landscapes, and culture. Architects Denton Corker Marshall have inserted 255 rooms into nine towers ranging from 11 to 28 storeys – sheathed in marble, travertine and granite – that rise like futuristic monoliths above a tree-lined street. The grandeur continues inside with an enormous batik installation that stretches along the lobby’s ceiling like a floating curtain. The rooms, softly accented by light timber and dreamy murals inspired by wayang (traditional Indonesian puppet operas), command views of the low-slung 300-year old city and the imposing silhouettes of the volcanoes that ring around Solo. 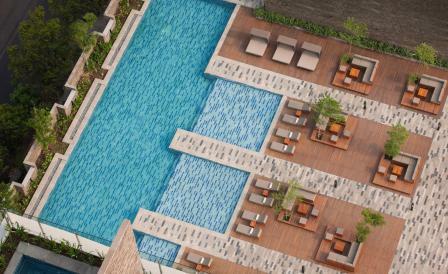 Meanwhile, the four suites on the 19th to 22nd floors feature terraces framed by hanging gardens and plunge pools. After a day touring Borobodur and Prambanan, the 10th-century complex of Hindu temples, check into the in-house restaurant Épice which offers a farm-to-table menu based on local favourites.